Got Barking? | Solutions For Nuisance Dog Barking! Solutions For Nuisance Dog Barking! Is Your Neighbor’s Dog Affecting Your Quality Of Life? DOG OWNERS, if you want to “bark train” your dog or received a complaint about your dog’s barking, you have several options. Your best course of action is to personally “bark train” your dog, hire an experienced dog trainer, or enroll your dog in obedience school. If you are unable to “bark train” your dog, bark control collars and ultrasonic devices are your next option. Have You Been Contacted By A Neighbor? Visit our Dog Owners page for more bark control information. If your NEIGHBOR’S DOG is affecting your quality of life, contacting the dog owner is the recommended course of action. Your neighbor may take responsibility and remedy the situation. If not, your final course of action may be to contact Animal Control. There are many “Bark Control” products on the market to address a neighbor’s barking dog. 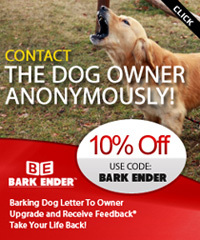 Bark Ender™ – Allows You To Contact The Dog Owner Anonymously. Visit our Solutions For Neighbors Of Barking Dogs page for more information. Nuisance dog barking is against the law in most areas. Be a responsible pet owner and a good neighbor, please control your dog’s barking. If your neighbor’s dog is affecting your quality of life, contact them, they may be unaware that their dog’s barking is a problem. If you are unaware of the “Dog Barking” laws in your area, Click Here to contact your local Animal Control.